Just when I thought the weather was changing we got hit with more freezing rain and snow. Here’s a picture taken in front of my house on March 11 after our last storm. The snow won’t be melting anytime soon. 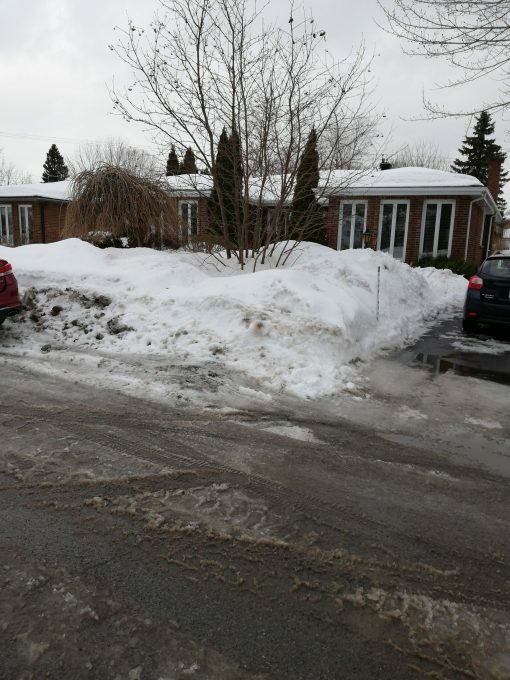 As a matter of fact I had to hack out a path through the snowbank/ice bank on my front lawn so that the oil delivery guy could get to my back yard. I couldn’t wait for nature to do her thing as my heat pump broke and I have been consuming more fuel oil than normal. It seems I have a freon leak which could be hard to locate and fix. Read Peter Payan’s account of his mishap while trying to negotiate Montreal’s sidewalks to get a sense of what things have been like this winter. Next, I started a new batch of beer, summer Cerveza, which should be ready for drinking by early May. It is a nice light beer and great on a warm summer day, especially when accompanied by a wedge of lime. And of course it is tax season so I have started compiling mine return, my wife’s, my brother George’s and those of my son and daughter in law. If that doesn’t take your mind off the weather nothing will. Still undergoing chemotherapy for lung cancer which was diagnosed in September. Unable to drive, feel quite weak, and only leave home for medical treatments. One more chemo before being checked to see if effective. 2019 began with an Ouch and a Bang for me. In January, my right foot developed a severe pain along the bottom of the right side. When I went to see my podiatrist, he discovered that I had a plantar fasciitis and gave me the necessary directions to treat it including buying 2 pairs of Birkenstock inner soles and using an Ice pack, tennis ball, an anti-inflammatory too. Luckily, within less than three weeks I had no pain. If that wasn't enough, on February 13th, I fell getting off a Montreal Transit bus at Concordia, bruising my right Knee while escorting a blind friend home from his doctor's appointment. Two Concordia students standing nearby, lifted me onto my feet and at that point, since I didn't feel any pain yet, I escorted my friend to his house using 2 metros and a bus, then took two more buses to get to my apartment, 44 steps above the sidewalk. Only when I sat down inside my door, did I notice the pain. 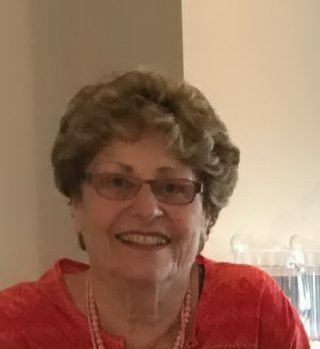 After recovering and being house-bound for 14 days, my first outing, a short one, was on Wednesday the 27th, the day after my 78th birthday. My wife was with me, guarding me as well as she could from all the icy places along the sidewalks. George Mitev (class of 1965) is Bulgarian by heritage but was born in Austria on the same day as Arnold Schwarzenegger in 1947, perhaps in the same hospital. His family immigrated to Canada in 1950 and George has been a long time resident of St. Lambert ever since. George retired last year and he and his wife decided it was time to downsize and get rid of the yard work, pool maintenance and snow shoveling. He put his house up for sale and within a week he accepted an offer - within another week he had purchased a condo on Victoria Avenue overlooking the Country Club. Now the real work begins, including hiring an architect to draw up plans for renovations to the new condo and choosing the right contractors. Anyone who has lived in the same house for a long time and is a bit of a pack rat (it seems George has 2 or 3 of everything) soon realizes the staggering amount of memorabilia, otherwise known as junk, that accumulates. Especially if you have raised two boys, Carl (class of 97) and Mark (class of 95) and they have left a lot of their “junk” behind when they moved out. You can sell some, give some away or, as a last resort, trash it. I don’t have all the details of how stuff was disbursed as it is still ongoing, however, I bought a 50 year old electric train set for my grandsons. I refused his offer on a leather couch (where would I put it) and am still in negotiations for one of his many lap top computers. He needs to sure he can get his personal data and files purged before he will let it go. 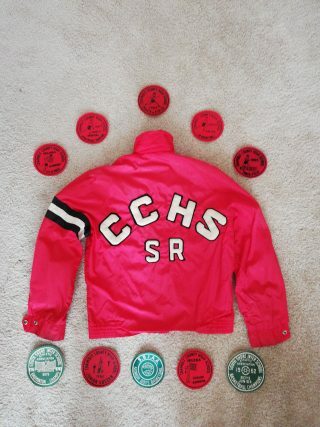 One week last month we were having lunch at Scottyz (yes, that’s the right spelling and a story for another time) when George brings in a bag containing his 1964 CCHS basketball jacket and a small satchel that held about twenty five crests from the same period. His golfing buddy, Dave Saunders (class of 63) started kidding him about his basketball ability since George is 5’ 6” maximum (with lifts). I know George as a very good golfer but nothing about his basketball skills, so for once I kept my mouth shut. 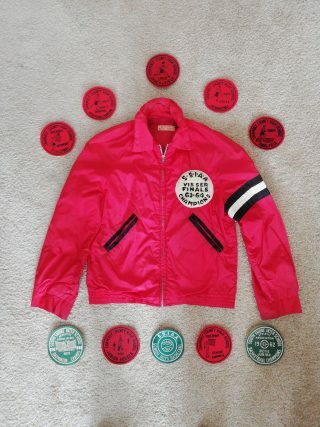 Anyway, George knew about my connection with the Alumni Association and asked if I could use the jacket. I said yes and plan to put it in the Association’s display case at the High School and, as you can see by the photos below, after more than fifty years it is still in almost mint condition. Today’s students will probably considered it a bit of an oddity as I haven’t seen a school jacket in ages. Don’t take this the wrong way as I am not implying this was part of his downsizing and get rid of junk campaign. Several years ago George had an extension added to his Irvine Avenue house to accommodate his mother, after her husband died. She recently turned 100 and is almost totally blind. George was able to place her in a semi-autonomous senior’s residence in St. Lambert and she is doing fine. George visits almost every day. 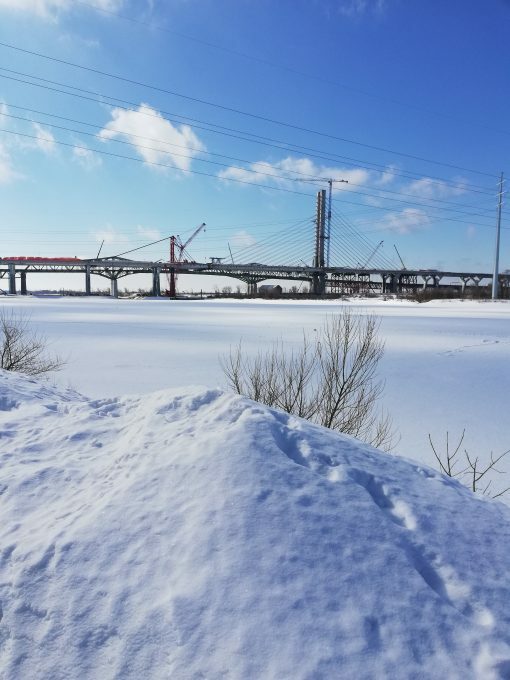 The new Champlain Bridge was supposed to be completed in December, 2018, but, they didn't quite make it. 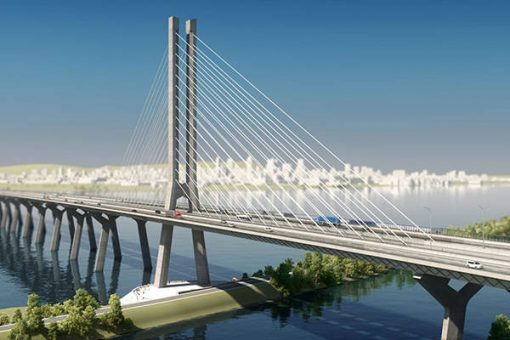 A number of factors led to the delay including a strike by crane operators and Transport Quebec's refusal to allow some of the very heavy concrete structures to be moved over provincial highways. Instead they had to be barged up the river which took additional time and money. Perhaps the schedule was a little optimistic to begin with. It now looks like the new completion date will be some time in June 2019 and the late penalties will probably hit the $150 Million mark, the maximum provided for in the contract. The new structure looks beautiful as depicted in the architectural drawing below. The second image is a picture I took in mid-March from the south shore. I didn't attempt to venture out on the ice for a closer shot, but you clearly see many of the construction cranes still in place and the suspensions cables that will support the super structure over the seaway channel. It looks like they are going to make the June date. And, looking at the partially completed new bridge while driving in to Montreal, it will be an impressive. It is much higher than the old structure and exactly like the artist's conception. The old bridge made it through another tough winter without any major closures for repairs, much to everyone's relief. Many people avoid the old bridge whenever they can given its recent history of structural problems. I'll try to get some photos of some of the additional support beams that had to be installed just to prevent the bridge from falling on route 132 on the south shore. Richard Bunnett worked for Chambly County High School and its successors for more than 30 years until he suffered a massive, debilitating stroke last year. He has not yet fully recovered and he needs a lot of help going forward. If you would like to visit he is staying at CHLSD St Lambert sur-le-golf, 555 Tiffin, St. Lambert, room D412. Any of you who worked on our reunions from 1995 onward should remember Richard as he was the committee’s “go to guy” whenever we had a question or needed something done. Whether it was organizing students, helping with equipment, setting up or taking down the auditorium, he saw to it that things happened. He never complained and gave up most of his weekends to make sure we had successful events. Although we have universal health care in this country, not all services are covered or at least not to the extent that is necessary. In particular physical and occupational therapy are strictly rationed and don’t go far enough. Patients, families or private insurers have to pay for anything required over and above the basics. In Richard’s case he does not have private insurance, has exhausted all job related benefits and he still needs lots of help. Some of Richard’s friends, have set up a “Go Fund Me” page seeking help from colleagues and friends. If you knew Richard and are willing to help, any donations would be greatly appreciated. It is with great sadness that we announce the passing of Greg Brown. Greg was born in Ottawa on October 27, 1956 and then quickly convinced his parents, Harold & Barbara Brown, to move to St. Lambert, Quebec. There he proudly attended, among other schools, Chambly County High School and McGill University. 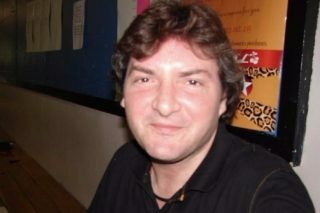 Greg then joined the English Exodus in the late 1970's and moved to Mississauga, Ontario where he obtained a Master=s degree from the University of Toronto. Subsequently he moved down the 403 to Hamilton. Greg was a sincere believer in Christianity and lived his life accordingly. Greg passed away due to a heart attack which resulted from an enlarged heart. Which is ironic because everyone who knew Greg was aware that he had a big heart. In the aftermath of this sad event, it has become apparent that Greg touched the lives of a great many people. 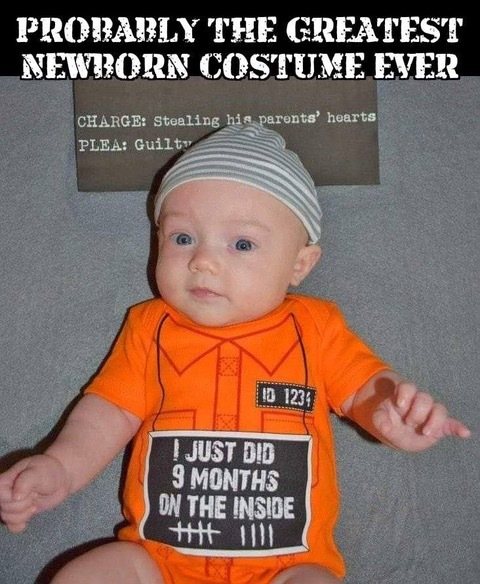 There will be a private family service. In lieu of flowers or a donation, please honour Greg by doing something nice for someone in need. He would like that. Harvey, sadly I must tell you that Bill Brown, class of 53, passed away Sunday night (March 24th), in Peterborough ON. Bill had been ill for some time, but still maintained contact with his close friends. Thankfully, a few of us who have maintained contact through the years, including Gerry O’Connor his closest friend, talked to him in the last several days. I miss him greatly. 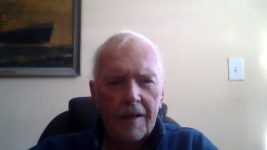 On Sunday March 24, 2019, Bill, loving husband and father of three, passed away peacefully at the age of 82. Bill was born May 19, 1936 in Greenfield Park, QC to Edward and Ellen Brown. He graduated from St. Lawrence University in Canton, NY in 1958 and worked in the Canadian Forest Products Industry throughout his career. He has three children, Dwight of Boston, MA, Cory of Portsmouth, RI and Jody of Delta, BC. In December 1994, Bill married Lise Richard and lived in Toronto until retiring to the Peterborough area in 1996. His early life revolved around sports in Greater Montreal where he played football and hockey for Chambly County High School and area teams. Despite the years and distance, he counted his boyhood friends from Greenfield Park and St. Lambert among some of his closest throughout his life. He received a hockey scholarship to St. Lawrence University, where his prowess on the ice earned him a reputation for speed and productivity. His sub-three-minute hat-trick stood on the record books for many years after his graduation and he was later proudly inducted into the St. Lawrence Athletic Hall of Fame. Post-college and hockey, his working years were equally successful: He held a number of executive positions in the paper industry and led two national industry associations for whom he frequently represented Canada on trips to Europe and Asia. Most of all, he maintained close relationships with many of his former colleagues up until the time of his passing. Bill had a passion for the written and spoken word. He was a voracious reader. He leaves a tome of speeches and poems, which he penned over the years and which range from the hilarious to the inspirational. He loved to work with his hands - the gentleman's farm of 60+ acres that he and Lise renovated in Norwood, Ontario gave him endless days of hard work as well as opportunities to learn new skills. Bill was preceded in death by his older brother Birt and younger sister Cheryl. He is survived by his wife, three children, three grandchildren, and his two brothers Robert of Victoria, BC and Gordon of Collingwood, Ont. 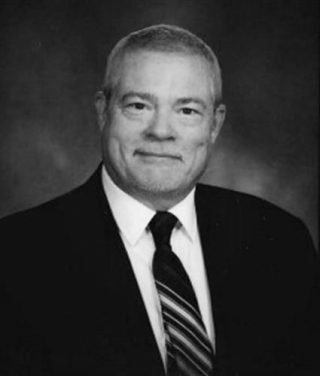 John Langtry, Class of 1968 and 68 years of age of Georgetown, Ontario, passed away on Friday March 22, 2019 at Georgetown Hospital in Georgetown, Ontario after courageously battling cancer for a number of months. John was born in Quebec on June 16, 1950, the only child of John and Barbara Langtry - both predeceased. He was raised in Saint-Lambert on the south shore of Montreal where the family attended St. Barnabas Anglican Church. John graduated from high school in Saint-Lambert with outstanding marks in math and sciences. John and his parents moved to Georgetown in 1968. They became strong supporters of St Alban the Martyr church which John attended until his death. Their support included significant contributions to funding the installation and maintenance of a formal pipe organ. John was an active participant in St Alban's Food for Life program - showing up each week to help with packing and delivering food to those in need. In 2017, John was recipient of the ON (Order of Niagara) award for St Alban the Martyr from the Niagara Diocese. John went to the University of Waterloo earning a degree in Mathematics in 1974. Following graduation, John had a proud and successful career working for Northern Electric, then transferring to Bell Canada from which he retired as Manager, Corporate Engineering in 2006. John was a proud and long-time member of the Masons. He was also an active lifetime Amateur Radio operator with his radio license (VE3NEC) proudly displayed on his car's license plate. In retirement, John devoted a portion of his time with volunteer organizations to mentor adults in the subject of mathematics. Memorial donations may be made to Georgetown Hospital Foundation or to St Alban the Martyr, Glen Williams. John's close friends wish to extend thanks to the staff at Georgetown Hospital for the care and support given to John during the last few months of his life. I looked like an idiot on the bus this morning.